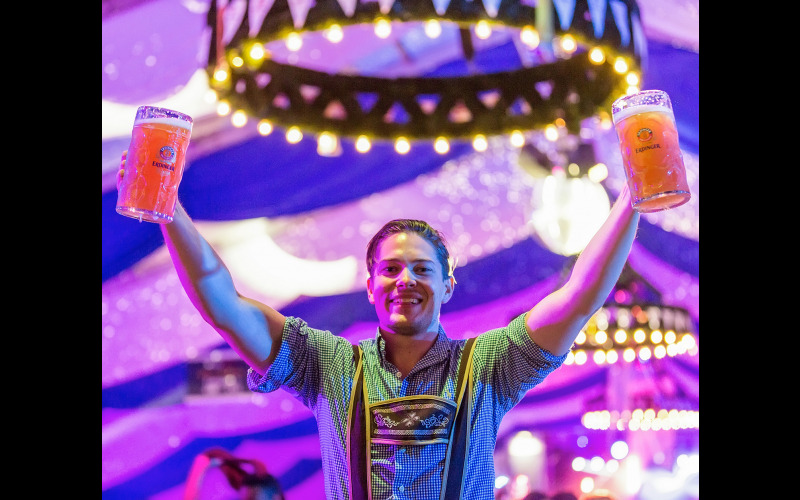 Here’s your chance to go to the world famous Oktoberfest and drink stein's of great Bavarian beer, and eat Bratwurst sausages in a traditional German beer hall served by bartenders in Lederhosen and barmaids in traditional German Dirndl dresses. We have got 8 tickets for 1 of the best tables right in front of live band’s stage for the incredible Erdinger Oktoberfest at the opening night on the 5th of October. There will be a full fun fair outside, plus open air Alpine village, German shops and live music and DJs till late. This traditional German event will be located adjacent to the O2 Arena in London’s Greenwich Peninsula overlooking the Thames. German brewer Erdinger will build an entire traditional Bavarian beer hall set in a huge open-plan beer hall made from wooden floors and walls, with genuine imported wooden Alpine huts. To add a touch of German tradition the beer hall will be decorated with floral garlands, and a traditional blue and white striped roof. Numerous Oktoberfest bands from Munich and modern pop acts and DJs will run through the evening, giving you a chance to experience the Bavarian enjoyment of life in London. Tickets start from £10 for general admission to the beer hall event but there are cheaper tickets that allow access to only the funfair for £5. VIP tables in a separate area are also available. Erdinger Oktoberfest will open on Thursday 5th October and run until Sunday 22nd October.